Welcome to the wonderful world of snow sports! Rental equipment MUST be picked up prior to the day of the first lesson. To ensure lesson availability, please book your lessons in advance. We cannot guarantee lesson availability for last minute reservations or walk in lessons. To book your lesson click here. If you are having difficulty reserving your lesson online, please contact our Call Center at 801-620-1110 between the hours of 8:30am-4:30pm daily. See our New to Snow Guide for more tips for a great day on the snow! Our Youth lessons, ages 4-12, meet inside the Learning Center and begin at 9:30 am. Our adult lessons ages 13+ begin at 10:00 am and meet in the Wildflower Meadow. Please arrive at your designated meeting area no less than 15 minutes prior to your lesson time. You will need to have your equipment on when you arrive at your meeting area. Every guest taking a lesson must have their pass media available for lift access during their lesson. There is no need to check in at the Snow Sports Desk if you have made a reservation and have your gear. Please consider weather and road conditions when planning your arrival. We invite you to use our guest drop off as well as our shuttle system to get to the base area. Bag Check is available in Earl’s Lodge. Adult guests will meet their instructors in the Wildflower Meadow. Instructors will put each person into a group based on skill level. Youth 12 and under will need to be signed into their lesson meeting area by a guardian. Our Youth lessons include lunch, adult lessons do not include lunch but groups usually eat together in Earl’s Lodge or Needles Lodge. If you do not plan to eat with the group, set a meeting time with your instructor and exchange phone numbers. No outside food or drink is allowed in Snowbasin Resort Lodges. All lessons end at 3:00 pm, however, your lift access is good until 4:00 pm. For those of you that would prefer a private lesson experience, we offer Learn & Earn members a $149.00 upgrade option. Space is limited, please call (801) 620-1110 to reserve your private Learn & Earn lesson. 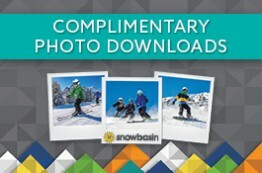 Snowbasin Resort warmly opens their arms to first time skiers and snowboarders with the most affordable first-timer package out there! Ever wanted to learn to ski or snowboard? Plan to do it next winter at Snowbasin Resort. The Learn and Earn Package is on sale.